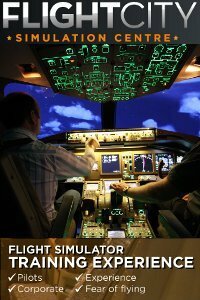 Thanks to the folks at Flight City Simulation Centre in Perth, we have been able to give away a one hour flight session in their Boeing 777 simulator to give away, valued at $275. Of the many people who correctly recognised that the airline jingle belonged to “Australian Airlines,” Graham Neal was the lucky winner. Congratulations to Graham and also to David Mitchell & Greg Spencer who were our “runners up” winning a PCDU T-Shirt each. Thanks to the folks at Flight City Simulation Centre in Perth, we have a one hour flight session in their Boeing 777 simulator to give away, valued at $275. All you have to do to win is listen to PCDU Episode 45 where we play a jingle that belonged to an Airline over here. Have a listen to the jingle and then email us with your answer (even if it may be wrong :). We’ll draw the winner live on uStream and also announce them in a future episode.